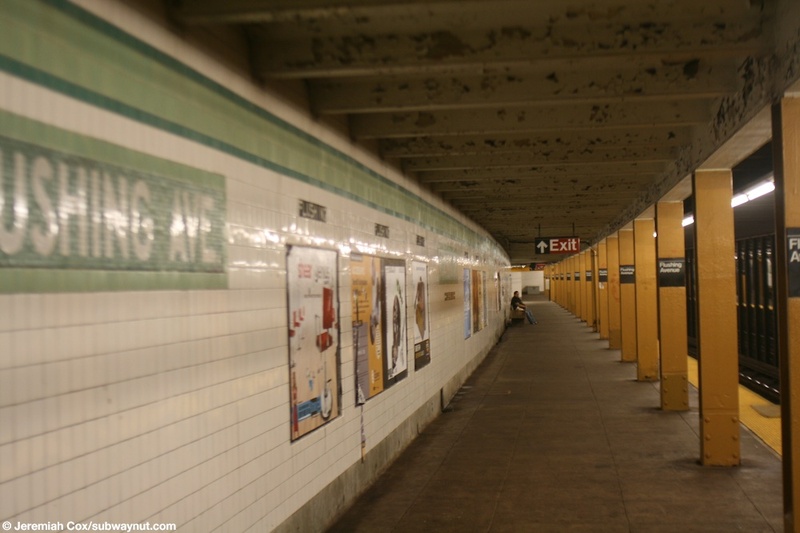 Flushing Av is another G train station that is in quite bad shape and seems almost abandoned. 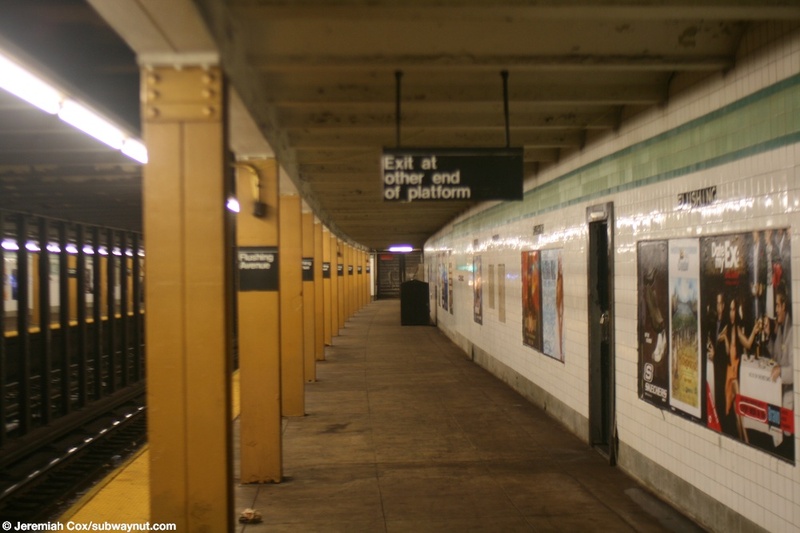 The station has two side platforms with platform-level exits to Flushing Av on each platform towards at their southern ends. There are also signs for a now closed exit to Walton St; this is evident from exit text still plainly visible underneath some of the name tablets. This exit had a mezzanine of some size and there is a gated off staircase at the extreme northern end of each platform that must have lead to this exit. The station currently has no free crossover or under. 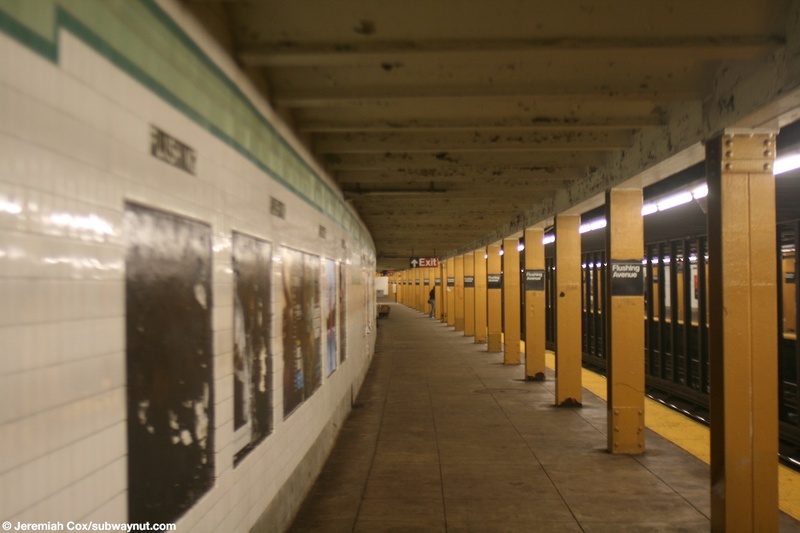 There are dark yellow station columns and the typical tiling for a G-Crosstown line station. (flushingg1) It's twilight on an entrance to Flushing Ave.
24 July, 2008 (flushingg2) The small fare control area on the Queens-bound platform at Flushing Ave. 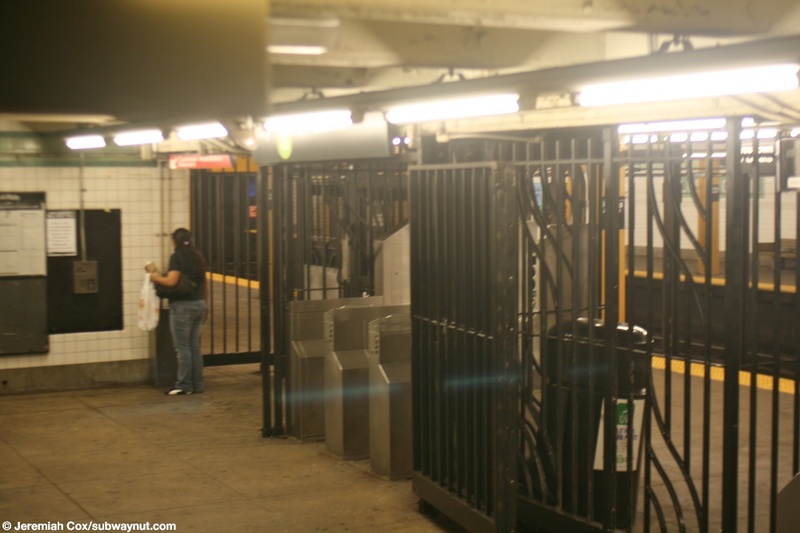 There are also some High Entrance Gates not pictured so the Manhattan-bound token booth is the only one open full time, even though the station has no over or underpass. 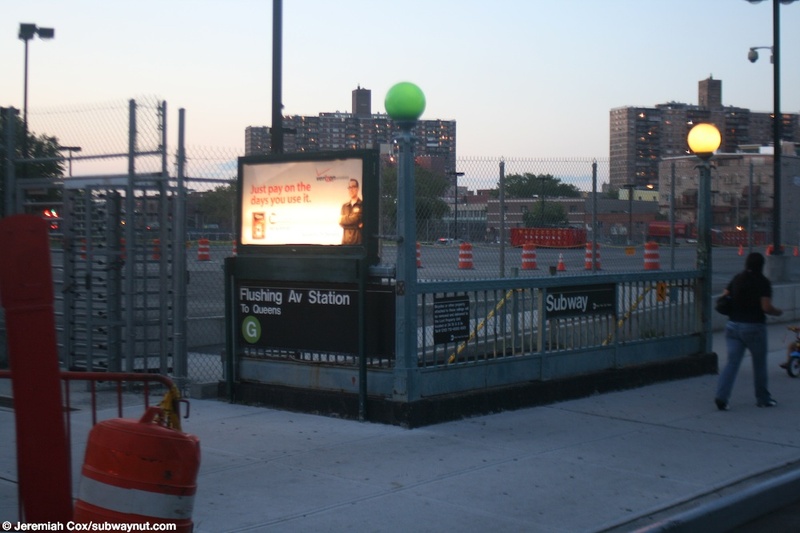 24 July, 2008 (flushingg3) A Flushing Avenue column sign on the dark yellow columns. 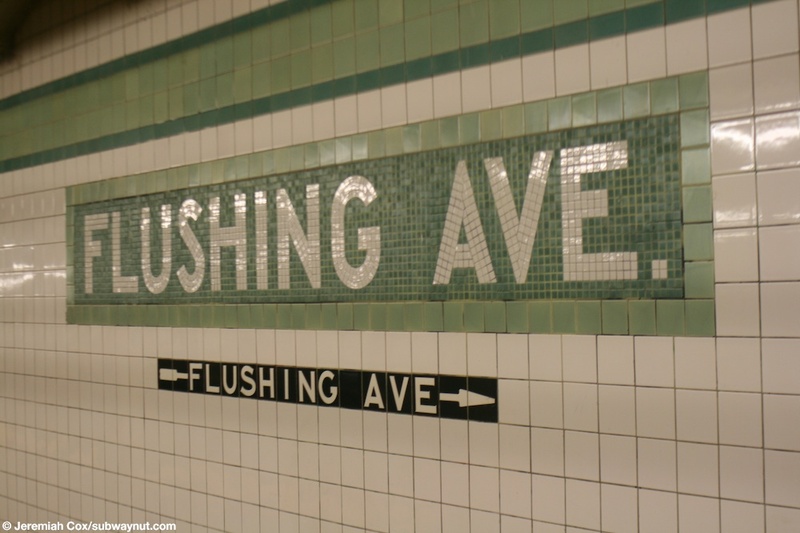 24 July, 2008 (flushingg4) Looking across at a name tablet on the Brooklyn-bound platform at Flushing Av, tiling for the exit to Flushing Av is underneath it. 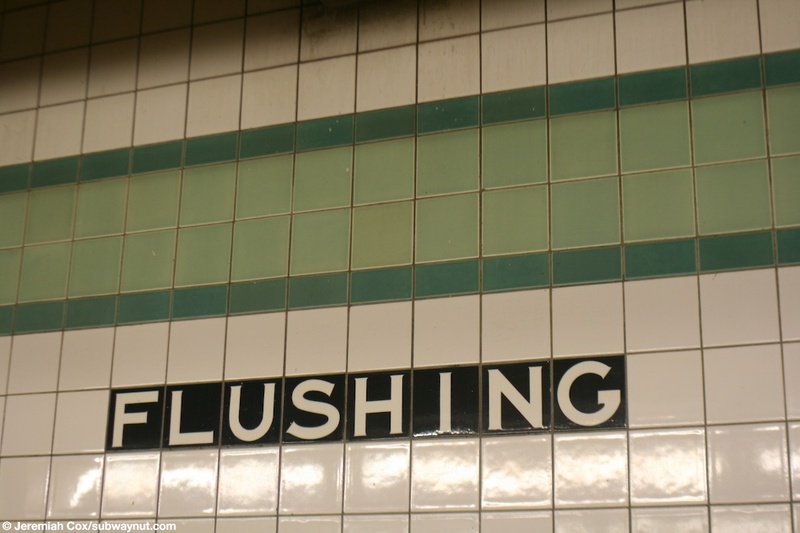 (flushingg5) The Flushing tiling on tile below the light green with a darker green border trim. 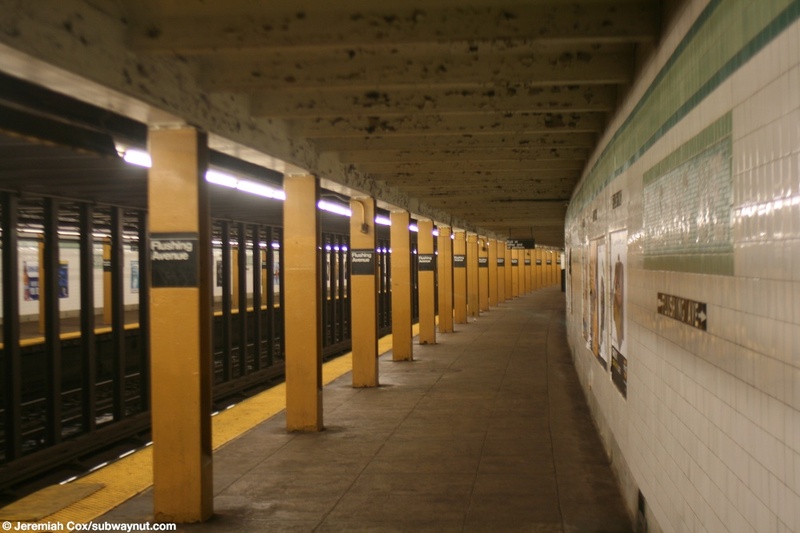 24 July, 2008 (flushingg6) Looking down the Queens-bound platform at Flushing Av towards the middle towards the station's only exit that is currently open at the southern end. 24 July, 2008 (flushingg7) Looking towards the front of the Queens-bound platform at Flushing Av at the abandoned exit. 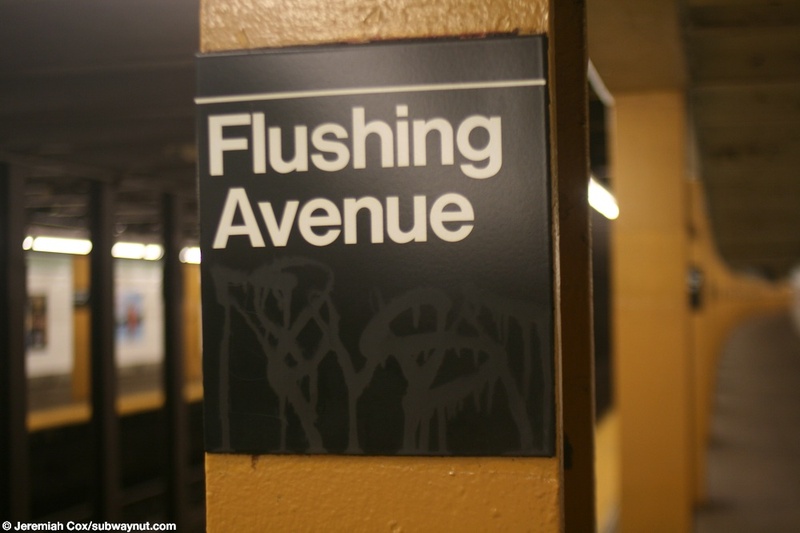 24 July, 2008 (flushingg8) A name tablet at Flushing Av with an arrow for the exit at Flushing Av underneath it. 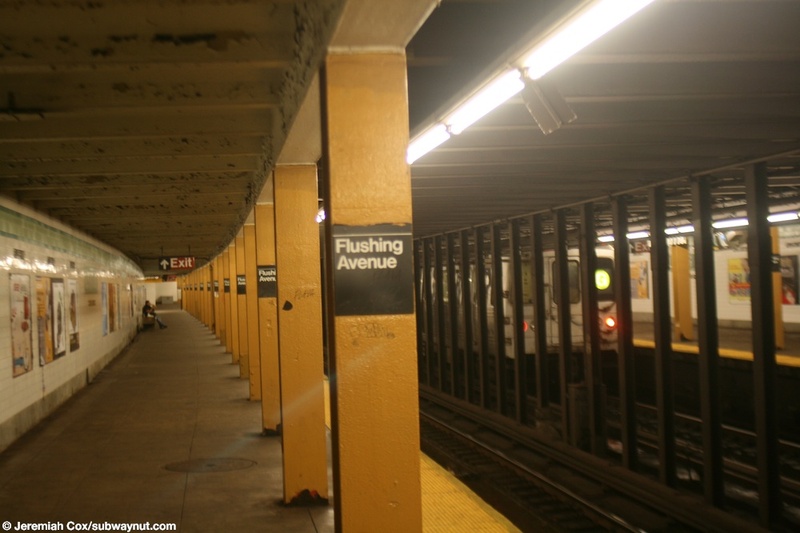 (flushingg9) Another view down the Queens-bound platform at Flushing Av, trains stop at this car mark. 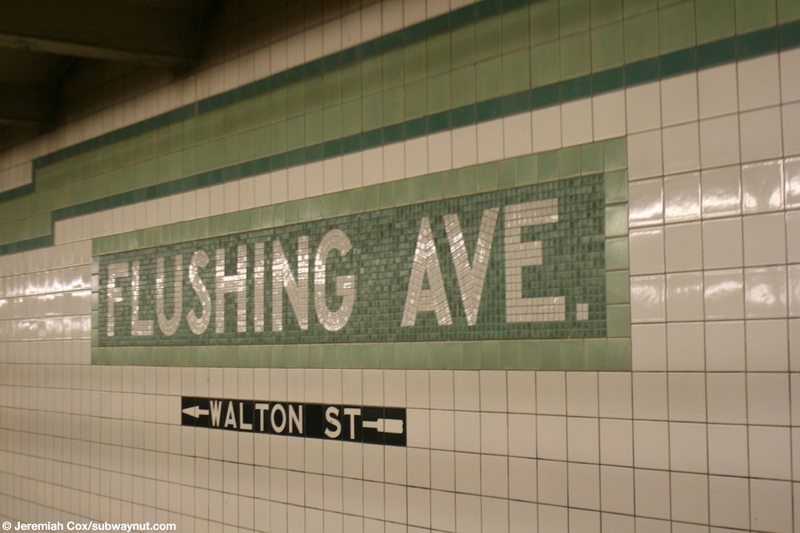 24 July, 2008 (flushingg10) A name tablet at Flushing Av with tiling for the now closed Walton St exit underneath the tablet. 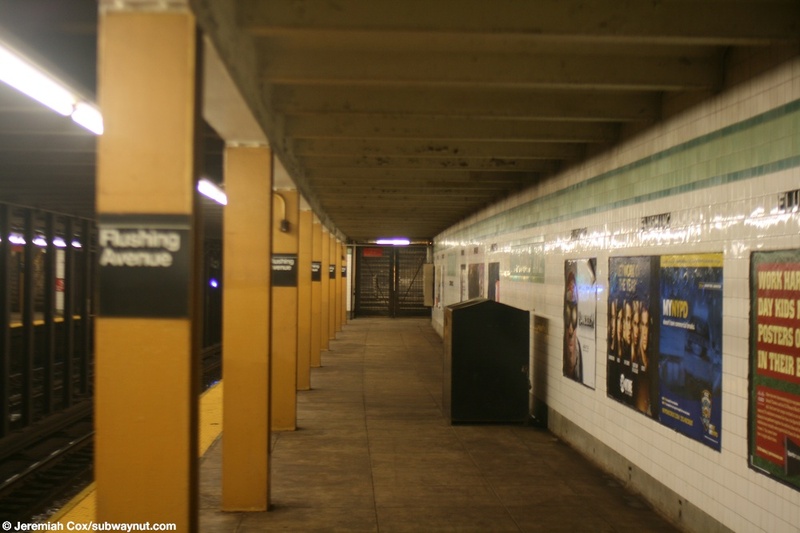 24 July, 2008 (flushingg11) Looking down the portion of the front of the Queens-bound platform at Flushing Av that never sees trains stopping at it anymore, towards the staircases that used to lead to a mezzanine and the Walton St exit. 24 July, 2008 (flushingg12) Another view down the Queens-bound platform from the northern end with the exit on the other end. 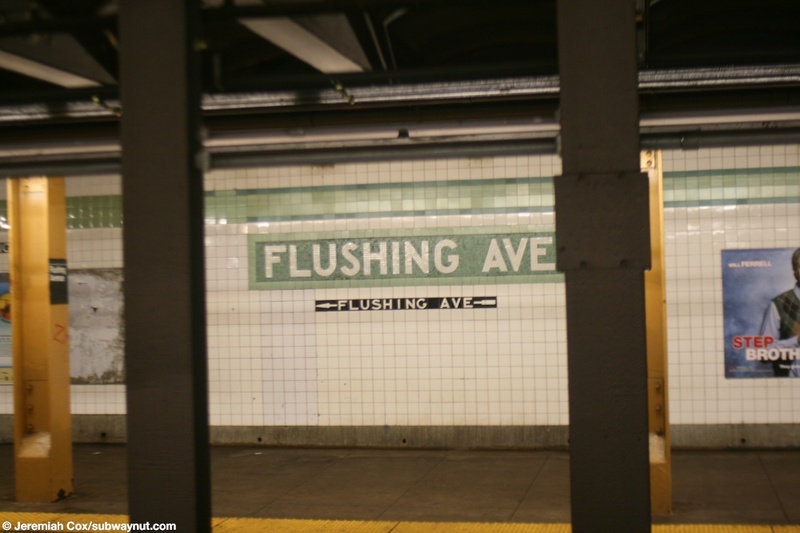 (flushingg13) A final view looking down the gently curving platform at Flushing Ave.